Academy Award winner Robert Zemeckis directs Steve Carell in what is being hailed as one of the most original movies of the year. 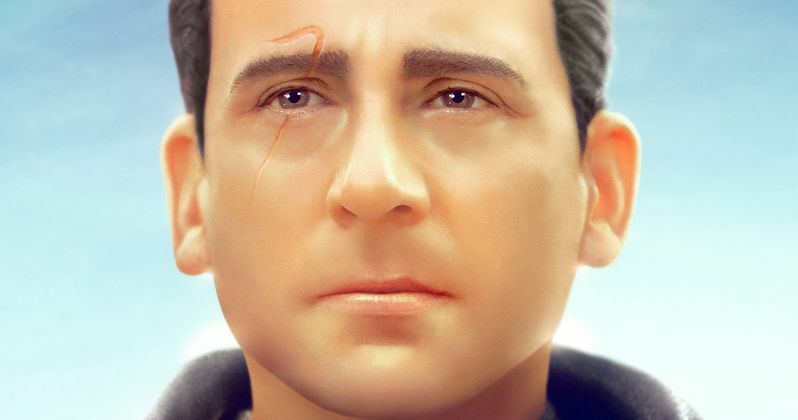 Welcome to Marwen tells the incredible true story of one broken man's fight as he discovers how artistic imagination can restore the human spirit. The first trailer is powerful and has the hallmarks of some of Zemeckis' best work, including Forrest Gump and Cast Away, telling a heartbreaking story punctuated by heartwarming and humorous scenes. Welcome to Marwen will more than likely get brought up quite a bit during awards season. When a devastating attack shatters Mark Hogancamp (Steve Carell) and wipes away nearly all of his memories, no one expected him to make a full recovery. Hogancamp begins putting together pieces from his old and new life, and meticulously creates a fantasy town where he can heal as well as be heroic at the same time. In his fantasy world, Hogancamp is protected by a group of strong women, who are based off of people that he knows in the real-world. The women can be seen in action figure form mowing down enemies with machine guns to protect Hogancamp. As previously noted, Welcome to Marwen is based off of a true story. On April 8th, 2000, the real-life Mark Hogancamp was attacked outside of a bar by five men who nearly beat him to death. Hogancamp spent nine days in a coma and then an additional forty days in the hospital. When he awoke, he believed that it was 1984 and that he was in Ibiza. He was discharged with brain damage that left him little memory of his previous life and he could not afford the physical therapy that he needed to fully recover. Hogancamp instead created a 1/6 World War II-era Belgian town and populated it with people that he knows, including his attackers, which is where the strong women who protect Hogancamp in Welcome to Marwen step in. Welcome to Marwen is executive produced by Jackie Levine, as well as Jeff Malmberg, who directed the riveting 2010 documentary on Mark Hogancamp that inspired the film. Steve Carell stars alongside, Leslie Mann, Diane Kruger, Merritt Wever, Janelle Monáe, Eiza González, Gwendolyn Christie, Leslie Zemeckis, and Neil Jackson. The official tagline that arrived with the trailer sums it up best. It reads. "In a bold, wondrous and timely film from this revolutionary pioneer of contemporary cinema, Welcome to Marwen shows that when your only weapon is your imagination... you'll find courage in the most unexpected place." Welcome to Marwen opens in theaters on November 21st, and for viewers looking to get some more background on Mark Hogancamp's story, check out Jeff Malmberg's 2010 documentary Marwencol. The documentary is highly acclaimed and as previously noted, is the inspiration behind the film. You can check out the very first trailer for Welcome to Marwen below, courtesy of the Universal Pictures YouTube channel.